MEDIA FIX: Upcoming George W. Bush Memoir Eagerly Embraced By—The Democrats? (This guest post written by Nation intern Melanie Breault.) George W. Bush’s memoir Decision Points — remember, he was "The Decider" — is not set to be published by Crown until November 9th, the week after the 2010 midterm elections, but it’s already raising alarms, and not just in the predictable places. The former president says his book is not an autobiography, but more of “an analysis of key decisions in his life, both before and after he was elected president,” according to the early pubilcity. That’s fourteen decisions to be exact. Already we know that Decision Points starts with an anecdote about the night Laura Bush asked her husband whether he preferred booze to fatherhood and how from that moment on, he quit drinking, cold turkey. Crown says the book gives "gripping, never-before-heard detail" about the disputed 2000 election, how he responded to the 9/11 terrorist attacks, the wars in Iraq and Afghanistan, Hurricane Katrina and the financial crisis. Bush will also write “honestly and directly” about his weaknesses and mistakes as president, as well as his path out of alcoholism. News emeged today that Bush would grant his first big interview for the book on November 8 with NBC’s Matt Lauer. As Bush edits the final touches of his opus on his computer in Dallas — it’s already marked down from $35 to $18.90 at Amazon — GOPers can’t decide whether they’re happy about this new release or depressed. Former aide to the president Matt Latimer says the publication date — surely highlights from the book will be leaked before Election Day — represents “monumentally bad timing.” Paging Julian Assange! Other conservatives call Bush “selfish and stupid” because of the timing, like Lebron James (but with less access to ESPN hype). Latimer titled his Daily Beast article, "The Bush Book Bomb." Bush is not on the ballot this time, making the midterms “a referendum on Barack Obama,” says GOP strategist John Feehery, in NPR’s report. But still, nervous Republicans would have preferred a later release date. "Right before Christmas," Feehery suggests. "It would make a nice stocking stuffer." The Democrats have already started putting out the welcome mat for Bush era nostalgia, as Laimer describes in his piece for The Daily Beast: Rep. Chris Van Hollen, chairman of the Democratic Congressional Campaign Committee, said: “The more flashbacks of the Bush era we have, the more people will be reminded about the huge mess that Barack Obama and the Democrats inherited." But Republicans like Sen. John Cornyn think this book is a great idea and that the GOP can use it as Americans become more dissatisfied with the increasing national deficit under the Obama Administration. He told C-SPAN, "I think a lot of people are looking back with a little — with more fondness on President Bush’s administration, and I think history will treat him well." Since Bush is no longer the president, voters are warming up to “Bush, the person,” so they may also be intrigued by his memoir, not resentful. Its Amazon page offers a "three-fer" with latest books by Bill O’Reilly and Laura Ingraham. 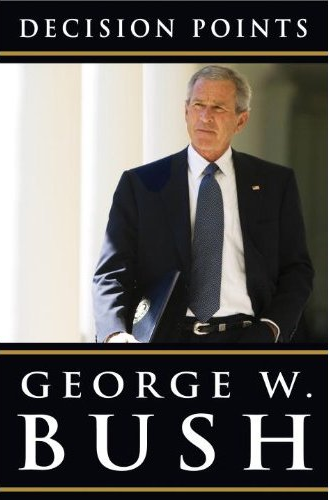 Bush says he wants historians to use this book as a tool to evaluate his presidency. "I don’t think you can come to a definitive conclusion about a presidency until the passage of time," Bush said. "I want to put you in my position."